Natural and organic wool bedding helps provide a deep and restorative sleep because wool helps maintain your natural body temperature and also wicks away moisture, keeping you dry and comfortable through the night. Being hypoallergenic, wool also naturally repels dust mites and inhibits the growth of other allergens such as bacteria, mold and mildew. Most of our wool bedding is made of certified organic wool or Eco-Wool. Learn more here about amazing near-organic Eco-Wool. Because wool is naturally flame resistant, wool mattresses, mattresses with a wool-wrap and other wool bedding have the ability to meet flammability requirements naturally, and therefore have absolutely no chemical flame retardants added. Wool has natural loft that allows it to remain springy, even after years of use. ECO Sleep Solutions showcases the all-wool mattress by Shepherd’s Dream in its Eugene, Oregon showroom. Containing exceptional quality Eco-wool, this five-inch-thick futon-style mattress consists of ten layers of thick wool batting covered with a soft and non-scratchy Eco-wool textile. It will compress about 10% during the first 6 months of use, but will not continue to pack-down further over time like cotton will. Wool’s natural loft prevents compacting. With proper care, this mattress will last for several decades. The Eco-wool mattress is resistant to mildew, dust mites and other moisture-related problems because wool evaporates moisture extremely quickly. Wool has many other great properties including the ability to keep you dry and comfortable all night. 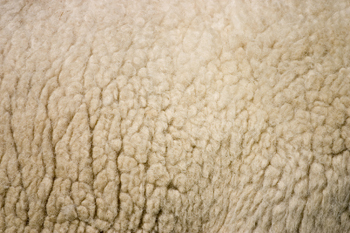 Add extra softness to any mattress with a Holy Lamb, hand-made Eco-Wool, mattress topper. Inside the organic cotton ticking are layers of thick Eco-Wool batting. 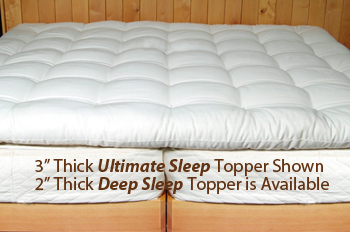 This natural-fiber topper is available in a plush two-inch version called The Deep Sleep topper. The Eco-Wool batting topper is also available in a sumptuous three-inch-thick version (50% more wool than the Deep Sleep topper) called The Ultimate Sleep topper (shown). With a soft, pillow-like feel, you will experience the very finest in all-wool sleeping comfort. 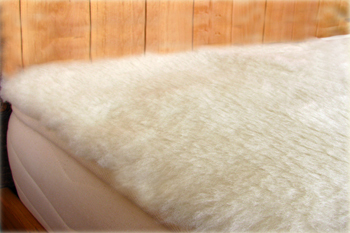 We have in-stock, Eco-Wool fleece mattress toppers by Holy Lamb Organics. These are extra dense lambs-wool toppers minus the sheepskin. Instead, the wool is sewn directly to an organic cotton backing. With this humane construction, you get to avoid the chemicals used to tan the hide, and the sheep get to keep their skin. 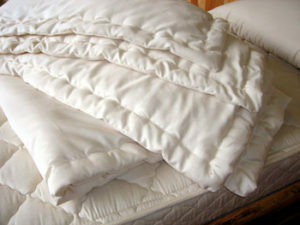 To protect your mattress, we carry, in-stock, beautiful Holy Lamb brand Eco-Wool mattress pads. These top-quality mattress pads help keep your mattress dry and clean. Protect your mattress investment with a natural-fiber mattress pad of equal quality. 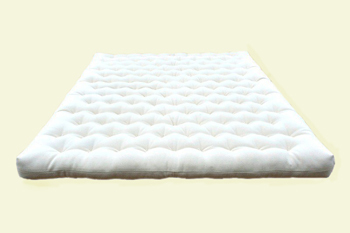 Wool mattress pads provide the best protection of any natural material. To get better protection one would have to use vinyl or some other synthetic cover. The wool mattress pads are available in crib-size too. Hand made using organic cotton sateen fabric. The inside the sateen fabric is premium eco-wool. Hand stitching around the entire perimeter and tufting throughout keeps the wool in place. They are comparable in terms of warmth and weight to a high-quality down comforter. Wool allows better air-flow than down, so you don’t get over-heated. And unlike down, no animals have to die to produce the product. The entire perimeter is hand-stitched and these wool comforters are soft, lightweight and very cozy. Machine washable gentle, with special instructions. Pendleton natural wool blankets have been made here in Oregon since 1863. Not only are these wool fabrics richly colored and delightful to touch, but they are also created to leave the lightest impact on earth. In particular, Pendleton Eco-Wise Wool passes strict standards of sustainability and responsible environmental stewardship. 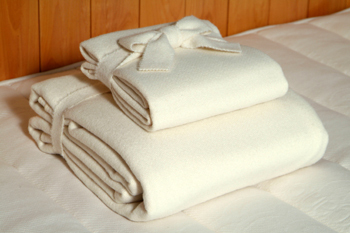 The Eco-Wise blankets shown here are one hundred percent virgin wool, have non-toxic finishing and are machine washable. Unlike most apparel manufacturers, Pendleton is a vertically integrated company. This means that it performs all the manufacturing steps, from start to finish, for many of its products. Raw wool is processed and made into fabric. Some of the fabric is constructed into beautiful blankets. Vertical manufacturing gives Pendleton the advantage of monitoring every step of the production process to maintain a quality and value through close attention to detail and high efficiency. 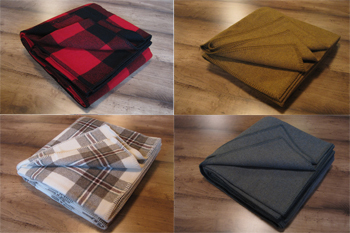 These blankets are Pendleton ECO-Wise blankets. They are certified Cradle-to-Cradle. This means the inputs are carefully screened for toxicity, biodegradability and other criteria. Pendleton has a strong commitment toward making quality blankets while protecting the environment. An Eco-Wool pillow has fantastic properties. It is nearly as soft as goose down and has a more consistent density. Because wool wicks away moisture it also helps you stay dry and comfortable. It also stays free of dust mites, mildew and other moisture-related allergens. 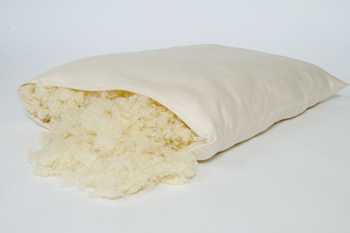 All of our wool pillow casings are made of certified organic cotton and the wool fiber inside each pillow has been processed gently at an organic mill and contains no chemical residue at all. 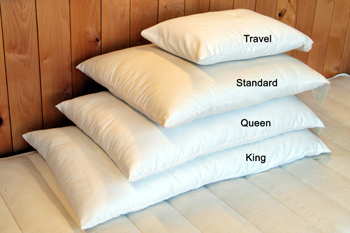 The Holy Lamb brand Eco-Wool Sleep Pillows come in three different sizes. They also come in Body-Pillow sizes. This type of pillow is one of our softest. The Holy Lamb brand Adjustable Wool Pillows are a comfortable and unique pillow filled with very small tufts of Eco-Wool. This pillow is very malleable which makes it a great pillow for those who shift between side sleeping and back sleeping. The zippered case lets you remove some tufts to lower the height, or add tufts to increase the height.